Comedy actress Emma Chambers was born Emma Gwynedd Mary Chambers in Doncaster's Western Hospital on 11th March 1964. The Vicar of Dibley star lived on Bawtry Road and was the daughter of John Samuel William Chambers, a consultant obstetrician and gynaecologist, and Noelle Gwynedd Chambers, (nee Strange). Emma went to primary school at nearby St. Mary's (now Hill House School) in Doncaster, before the family moved to Hampshire. She has starred on stage and screen from Drop The Dead Donkey, The Bill and How Do You Want Me? to featuring as Hugh Grant's sister in 1999 romantic comedy film Notting Hill. Emma is best known for 13 years starring in Dawn French's acclaimed sitcom The Vicar of Dibley (1994�2007) where she played blonde and dippy Alice Springs Horton (n�e Tinker), the Verger. 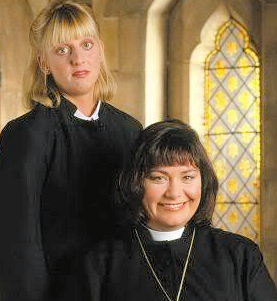 The Vicar of Dibley received multiple British Comedy Awards, two International Emmys, and was a multiple British Academy Television Awards nominee.